﻿ Can't See the Wood for the Trees? We live in interesting times, so much to ponder over, so much to wonder about. Changes accelerate in gushes and spurts. As we are flooded with more uncertainty than we can can cope with we are blessed, in a mixed up sort of way, with many teachers, saviors, guides, coaches, uncles and best friends who toss us life preservers. Although all of them look round and as if they'd support a body, they are really of two types. One is offering to preserve a sense of personal empowerment, offering ways to increase the effectiveness of intent upon outer circumstances, offering ways to kick your feet and beat your arms more effectively to get your way. Another offers the gift of embracing what is happening, realizing the teaching power of the symbolism imagined in what is perceived in the moment, accepting pure awareness as the unchanging identity in a pandimonium of oneness that takes the likes of PT Barnum to divert us from our folly and become entertained by the love of the moment. I run along by a few axioms. Can't prove 'em, but they are handy, and dearly beloved by me. One is that Creation is intelligent and intentionally evolving. Be Here Now is the doorway to what is truly real, satisfying, and sustaining in life. Be Still and Know, I am.... Nature is the best teacher. Every created is an expression of the Source. The senses perceive the externals, the material fundamentally, the imagination perceives the spirit internally, metaphorically in symbols. It's no surprise that in our days of accelerating uncertainties and rapid changes, we'd look for tools that could see what we can't. Divination is making a comeback, riding on the tenets of consciousness concerning a unity of Creation. Divination seeks to realize what is in Divine Mind, not by looking inward unguided, but by drawing upon a reflection in the outer world as to a clue to "what's up." Perhaps the I Ching was the earliest exampe of the creation of a full divinatory system. I've read that the inventor of this system did so by contemplating patterns in nature. The wise person recognizes, respects and rests in the peace of acceptance of these qualities, and plans his journey accordingly. While I respect the orgins and the simple binary code (solid and broken lines, stationary or changing) of the system, it has always puzzled me how nature could be abstracted to such a rarefied extent as a stack of lines. I've now come upon a book that has the same basis is the I Ching: nature as source of wisdom, synchronicity, and symbols. In this case, however, the symbols are the items of nature, not abstract lines. 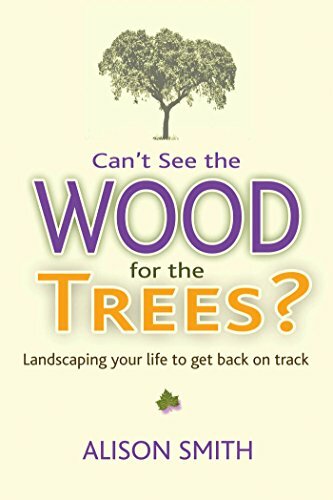 The basic idea of Can’t See the Wood for the Trees? : Landscaping Your Life to Get Back on Track is to use one's actual life space as the divinatory board, to reframe one's existence as a landscape, and then to learn lessons from the trees and begin a process of editing, re-arranging, and updating the landscape of one's life. This approach goes a whole lot farther than resting against a tree, listening to the wind in the leaves, and hearing a message. We're talking about the entire environment. Life is constant change, and there's an intelligent flow to the business of Creation. On the other hand, people, God love 'em, get stuck and cut off from the flow. Our author, Alison Smith, works as a personal coach and developed this "organic" approach to helping folks tap into their intuitive ability to make contact with the Spark of Creation, inside and outside, to find their true and honest way to move forward into a life genuinely their own. The key to her system lies in the "figures of speech" (metaphors) that we have to describe our predicaments that borrow from scenes in nature. Here are some of them: "Making mountains out of molehills." "Up the creek without a paddle." "Like a fish out of water." "Out on a limb." You get the idea. Then you work with this metaphor, filling in the details, and then as in dreamwork, begin to explore where you might go from there. What happens is that you begin to become sensitized to the symbolic communications in every moment out in nature, and you can feel the world around you accompanying you on your quest to improve your landscape. It's no surprise that the publisher of this book, Findhorn, has a history of revealing a lot of magic in nature. Highly recommended.